If you have been following some of my American Girl posts on Northern Cheapskate, you have come to realize that while we have splurged on the dolls, all the clothes and accessories are the result of DIY projects or are purchased from another location but work with AG dolls. This American Girl doll closet is no exception to that. I would love to tell you it was quick and easy, but it wasn’t quite as quick and easy as I anticipated. I am going to share with you how I made it, but then also give my recommendations on how I would do it differently if I were to make another one. First, I started with a ClosetMaid 24.1-in White Laminate Stacking Storage Unit that I bought from Lowe’s for about $30 and a 1/2 dowel that I think was around $2. Build the storage unit as instructed and cut the dowel to size to slide in between the 2 sides. If you don’t have anything to cut with, many hardware stores will cut pieces of wood to size for you when you are purchasing it, at least many local hardware stores provide this service. There are already pre-drilled holes in the sides all the way up and down so you can stick in your shelf pegs where you want them. You can see from this picture that we put them near the top and closer to the bottom so that we had a big open space. In that space you can see that I installed the dowel that I had painted. 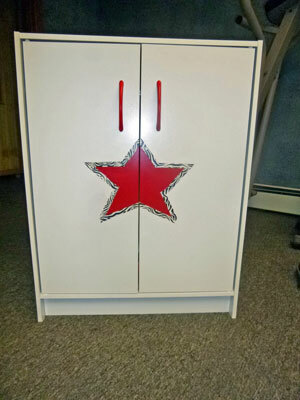 I used the same paint, which was a Rust-Oleum plastic spray paint, to paint the dowel as I did the star and the handles. It sticks fine to wood, but I bought it because I was painting on plastic door handles and the plastic laminate coating on the storage unit. Up to this point, everything worked out well. It was the painting of the star that I struggled with. If I did it over, I would not have painted it. I would have bought a sheet of of red Duct Tape (just like I did for the zebra print) and cut out a red star. JoAnn Fabrics sells a single 8.5×11 sheet of Duct Tape in various prints and colors for about $2. I have not looked at other store for them, so you might be able to find them other places. They have handy measurement lines on the back that make cutting in a straight line with an exacto-knife very easy. All of my zebra pieces are from a single sheet of Duct tape and cut on the lines. I went with red and zebra for my color scheme because red is the primary American Girl color and zebra is really popular with young girls right now, especially my daughter. As you can see from the photo of the outside of the closet, I lined the star with the zebra tape (to hide my non-straight paint lines – ugh!). 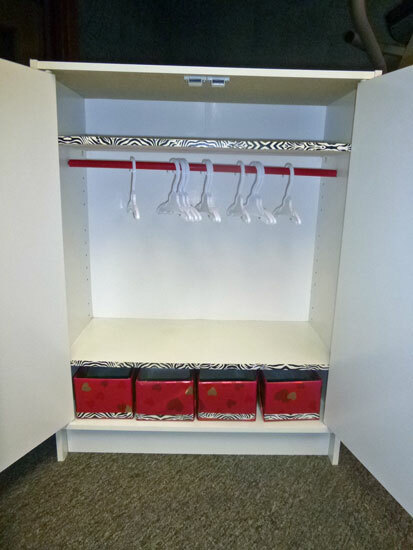 I also cut strips to adhere to the front of the shelves to bring the design inside the closet. Finally, I had saved some shoe boxes from this year that were all close to the same size and fit perfect in the space (shoes in a Girls size 2 to be precise!) and covered them with some red wrapping paper (from the Dollar Tree) that I secured in to place and added the zebra stripe to the front of those as well. 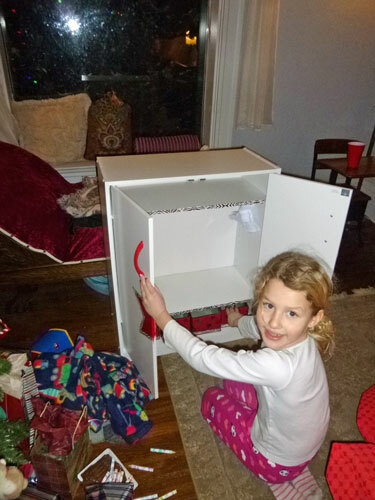 We gave this to may daughter this past Christmas and she was so excited to have a place to store her dolls and all their clothes and accessories. As you can see, once it is set up, it is not a small unit. The overall dimensions are 24″W x 11.5″D x 31.5″ H. She fits 2 dolls in it, her American Girl doll books and mini dolls and all of the clothes and accessories she has and there is still room to fit more. I made this closet for about $40. I first came up with this idea over a year ago when I saw something similar in size on the American Girl website for around $200. Right now, they do have a Storage Tower they are selling that is about half the size and doesn’t have doors for $85. 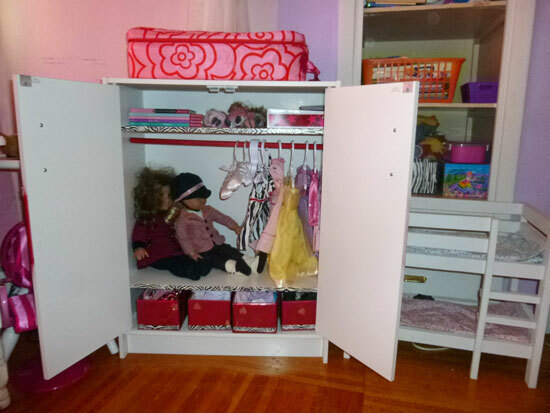 So, I am pretty pleased with this DIY American Girl Closet. Your Turn – Do you have any DIY Doll ideas to share? Super cute idea! Those dolls have a happy home! You did such a great job with that! It looks adorable! Oh my goodness. We’ve been looking for exactly this! Now that Kit, Ivy, Molly, Emily, Saige, Isabelle and soon Julie, have moved into our home I have no space for all those clothes! I actually bought a small suitcase and all of the dresses stay in there. Thank you for this! I have all boys, so no American Doll afternnons for me, but I think it is the most adorable store and doll chain ever! I think when I was a young girl that having a wardrobe for my dolls’ clothes was just as much fun as having the dolls! Great doll closet! I just saw this cabinet at Target and was thinking I could do something like this. So glad to see it works so perfectly! Love your extra special design details. I also love the little bunk bed, did you make that too?